The restoration work that characterised the Terminal of San Basilio revolves around the conservational recouping of the building and its transformation into a modular and multi-purpose space: the “Arterminal”. another, around 500 m2, which as well as serving as a second exhibition venue, also houses the entrance, restrooms and the bar area. The furnishings and the doors are simple and minimalist. The materials have been chosen so as to guarantee great flexibility to the space, thus making it capable of suiting all kinds of events, from an art exhibition to a workshop, and from a conference to a concert. These guidelines also inspired the choice of lighting, with versatile technologies making it possible to satisfy any kinds of light diffusion required. 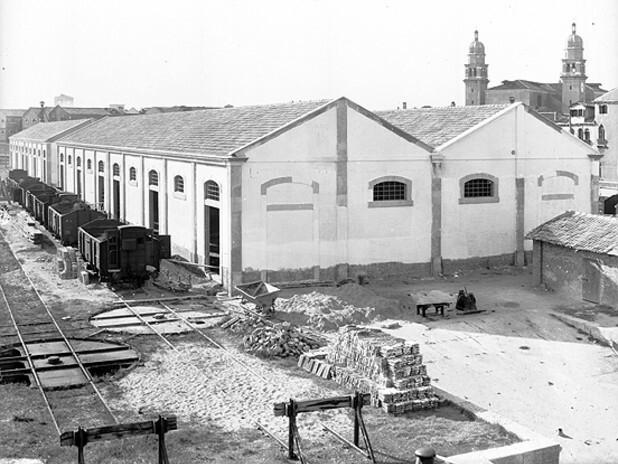 Lastly, as far as the exteriors are concerned, the building has been restored and repainted with a view to recouping the original colouring, respecting the urban context and that of the “portside tertiary sector” where the building is located (it was originally a port warehouse, as shown in the photo above). The overall investment was €250,000: financed by the Port Authority (which manages the maritime domain of the port of Venice) and Venice Terminal Passenger (concessionaire of the passenger of the port of Venice).